I’d never given any thought to whether pianos, like humans, are living, breathing beings with souls. That changed the morning I stopped by the Music For Everyone Keys for the City piano located in front of Lancaster’s Main Public Library early one May morning in 2010. Since 2010 MFE has been placing anywhere from 12 to 20 pianos, all designed and painted by local artists, on the streets of Lancaster. These pianos are accessible to the public 24/7 from mid-May through the end of September, making Lancaster the “Street Piano Capital of the World”. The objective of Keys for the City is to provide access to musical opportunity, foster creativity and build a sense of community among the public and, in the process, raise awareness for local music education initiatives. As Keys enters it’s eighth year, I can’t help but remember that morning in 2010 when I was taught that, yes, indeed, pianos are living, breathing beings with souls. It had rained the previous night, which presented an early challenge in what we were hoping would be a highly visible, four month public arts project. When we announced that we were going to place 20 pianos throughout town, available for everyone to play 24/7 for four months, everyone told us we were crazy. They told us that those pianos wouldn’t last a week before they would be vandalized. But we believed in Lancaster’s “better angels” and that our citizens were responsible and caring with enough civic pride that they would take care of these works of musical art. Maybe we were crazy, but to us it was not only a public art project, but a social experiment to test the power of music as a tool to bring people together. We were also told that being exposed to the weather would quickly render them out of tune. We were willing to accept that possibility as this was not about the stage at Carnegie Hall but rather the streets of Lancaster, PA. Further, when making music, it’s not how many notes you play, it’s how you play the notes you play. Even if they would become unplayable, they’d stand on their own as works of art. Many cities had sponsored art installations such as painted cows, (Harrisburg, PA) or crabs (Baltimore). Keys for the City represented a step beyond. Did the cows of Harrisburg “Moo”? Could the crabs of Baltimore…what sound exactly does a crab make? Keys for the City went a step further in making this exhibit fully interactive. This ability to “engage” people in a very direct way was a powerful of example of what “art” is supposed to do- get a reaction and illicit a response from people. Approaching the piano, I was a bit apprehensive due to the rain the previous night. As the piano technicians we consulted had warned, a good rain will cause the keys to swell and stick together rendering the instrument unplayable. We had planned for this…sort of. Eleven of the 20 pianos were under permanent cover, either under an awning in front of a local business or in another case, under a parking deck. The remaining pianos were not. These were equipped with portable plastic covers – think a giant, outdoor grill cover – which we hoped that citizens, neighbors, passers-by would use to cover them in the event of rain. This is where the social experiment came into play. Would the city “adopt” these pianos as their own and take care of them? This piano, on one of the city’s busiest streets, was the first we installed during the two day, mad rush to place all twenty. A big, sturdy, upright, it was colorfully designed by the staff of the sponsoring business, a local amusement park. In the first week, the Library piano got a lot of attention. It seemed as if there was always someone playing it, an elderly woman, kids with their mothers or folks waiting for a meal in front of the soup kitchen, which is housed in the church next door. As I approached the piano to check on its’ playability, there was a black man, probably in his mid 40’s, well dressed with thick black framed glasses, briefcase perched next to the piano bench, singing and playing beautifully, with real feeling. A handful of people, most, I assumed, on their way to work in the various government buildings, law firms and cafes that line N. Duke Street, stopped to listen for a few minutes before moving on. It was a beautiful scene. Exactly the type of scene we imagined when we contemplated Keys for the City. An example of the power of music to bring people – often complete strangers – together to share a moment, a song, a magical moment. Magical moments like these were occurring around the pianos all summer long at all hours of the day and night among all types of people. He replied, with a bit of a grimace, “She’s hurting a bit today. I play her every morning on my way to work.” Obviously, he knew “her” and it pained him that “she” wasn’t feeling well that morning. He spoke as if the piano were alive. I moved on to check the other pianos but the way he described that piano as a living, breathing being stuck with me. That was the first moment I ever considered a piano to be alive and that they had souls. I made it a point to play, albeit not particularly well, at least a few every day throughout the summer and found it to be true. Like people, pianos feel, sound and play differently every day. Of course, these day-to-day variations were, to a large degree, a result of changing weather. But regardless of why, the fact remains. They are not simply a collection of wood, keys and cables. They are, in fact alive. Every piano is unique in its feel, sound and personality. And like people, they have good days and not so good days. They can be moody. Some days can be somber while on other days, they are absolutely radiant and lively. 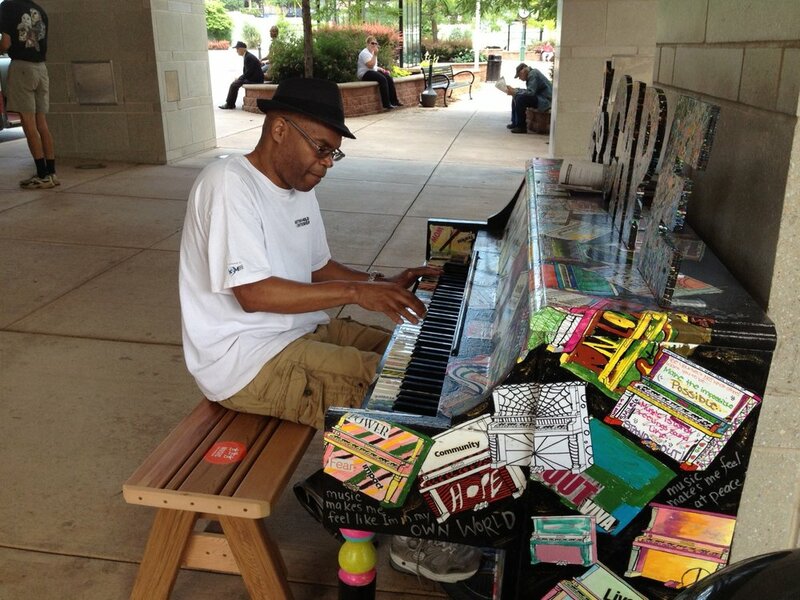 And as I learned on the streets of Lancaster, PA that morning back in 2010, pianos do, indeed, have souls. In a world of declining resources and increasing expectations for what constitutes an education worthy of the 21st century, every dollar counts. In such an environment, being able to effectively advocate for programs that yield the most effective educational ROI becomes critically important. As music’s power and potential as an effective educational tool becomes more apparent, music educators and advocates must become more aggressive and strategic in advancing music’s impact as a superior educational investment. Much has been said and written recently regarding the Manheim Township School District Board of Directors, particularly about its fiscal transparency but also about its provision of music and art education. The music programs offered to township students have been steadily reduced or eliminated in the past several years. This has occurred despite growing evidence of music’s value as an educational tool. Seemingly every week another study is released documenting how music education not only teaches character skills — teamwork, discipline, personal responsibility, innovation and creativity — but also improves performance in math, reading, language and logic. These are precisely the characteristics and skills young people need to succeed in the rapidly changing global economy and world community of the 21st century. My purpose here is not to extol the value of music education, but rather to highlight an important lesson in community and educational activism. Several weeks ago, the school board announced that some music education programs that had been cut would be restored. Some people claim the restoration is being made because the board is about to be audited by the state. While that indeed may be one reason, another important factor is the pressure on the board from parents and concerned citizens. For a long time, they have been active and vocal in drawing attention to the cuts and in pushing the board to restore them. So this column is less about the value of music education and more about how individual citizens and communities can directly influence educational priorities, programming and funding, particularly in the area of extracurricular activities. We live in a time of rising standards and expectations for our schools to provide students with an education that will prepare them for the future. Complicating that challenge is the fact that we also live in a time of increasingly scarce educational resources. Virtually every school district in the country is being forced to make hard choices concerning which programs and activities to sponsor and which to cut. Federal and state mandates dictate most program priorities and funding. But in the area of extracurricular activities, local authorities have the most freedom to prioritize and fund programs. That said, it seems that music and art most often end up being scaled back or eliminated. Yet parents and citizens of Manheim Township — through hard work and the persistence needed to keep the issue alive — made the public aware of the value of music education to the point where the school board felt compelled to reconsider many of its cuts. If you believe in the value of music education — not only for current students but also for developing a well-rounded, intelligent and creative populace — Manheim Township’s music lesson is this: Individual citizens, by banding together in a strategic, direct advocacy effort, can influence and even demand that our schools and communities invest more in music education. Here’s what you can do: Write a letter to the editor of the newspaper. Call a board member, or attend a board meeting and voice your concerns. Ask questions and demand answers. Attend a school concert, regardless of whether you have a child performing. It is wonderfully fulfilling and inspiring entertainment. Start a Facebook page as a way to network with friends who share similar concerns and dreams. 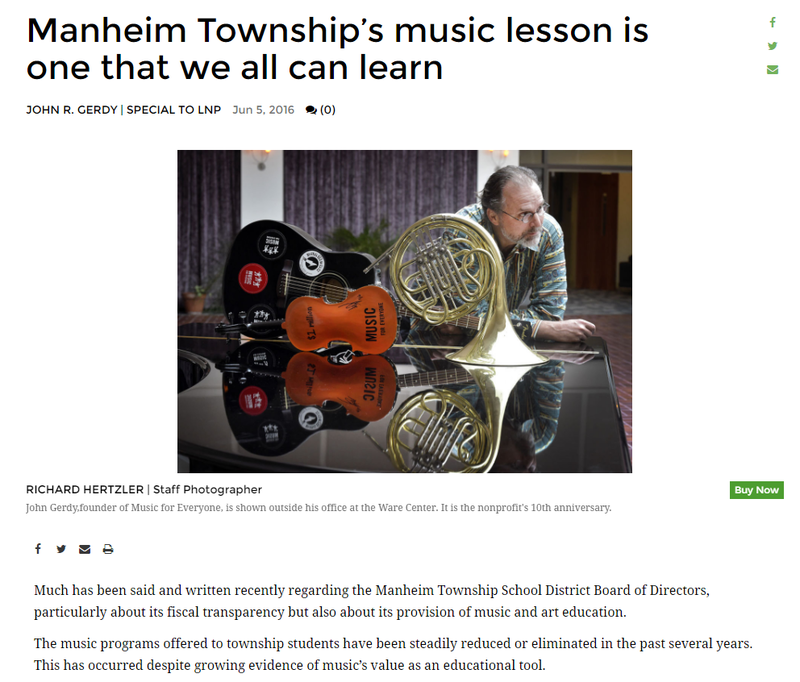 Ultimately, what is occurring in Manheim Township has less to do with appreciation for the value of musical education and more to do with community and educational activism. Manheim Township has shown us that, in the area of educational priorities and funding, individual citizens can make a difference. Those who believe in the power of music as an educational tool must stop bemoaning cuts to programs and start fighting to restore them. The citizens of Manheim Township have provided a wonderful lesson in how to do so. I’d never given any thought to whether pianos, like humans, are living, breathing beings with souls. That changed the morning I stopped by the Music For Everyone Keys for the City piano located in front of Lancaster’s Main Public Library early one May morning in 2010. Since 2010 MFE has been placing anywhere from 12 to 20 pianos, all designed and painted by local artists, on the streets of Lancaster. These pianos are accessible to the public 24/7 from mid-May through the end of September. The objective of Keys for the City is to provide access to musical opportunity, foster creativity and build a sense of community among the public and, in the process, raise awareness for local music education initiatives. As Keys enters it’s sixth year, I can’t help but remember that morning in 2010 when I was taught that, yes, indeed, pianos are living, breathing beings with souls. It had rained the previous night, which presented an early challenge in what we were hoping would be a highly visible, four month public arts project. When we announced that we were going to place 20 pianos throughout town, available for everyone to play 24/7 for four months, everyone told us we were crazy. They told us that those pianos wouldn’t last a week before they would be vandalized. But we believed in Lancaster’s “better angels” and that our citizens were responsible and caring with enough civic pride that they would take care of these works of musical art. Maybe we were crazy, but to us it was not only a public art project, but a social experiment to test the power of music as a tool to bring people together . We were also told that being exposed to the weather would quickly render them out of tune. But we were willing to accept that reality as this was not about the stage at Carnegie Hall but rather the streets of Lancaster, PA. Further, when making music, it’s not how many notes you play, but how you play the notes you play. And even if they would become unplayable, they’d stand on their own as works of art. Many cities had sponsored art installations such as painted cows, (Harrisburg, PA) or crabs (Baltimore). Keys for the City represented a step beyond. Did the cows of Harrisburg “Moo”? Could the crabs of Baltimore…what sound exactly does a crab make? Approaching the piano, I was a bit apprehensive due to the rain the previous night. As the piano technicians we consulted had warned, a good rain will cause the keys to swell and stick together rendering the instrument unplayable. We, of course, had planned for this…sort of. Eleven of the 20 pianos were under permanent cover, either under an awning in front of a local business or in another case, under a parking deck. The remaining pianos however, were not. These were equipped with portable plastic covers – think a giant, outdoor grill cover – which we hoped that citizens, neighbors, passers-by would use to cover them in the event of rain. This is where the social experiment came into play. Would the city “adopt” these pianos as their own and take care of them?